Ash Williams is accidentally transported to 1300 A.D., where he must battle an army of the dead and retrieve the Necronomicon so he can return home. After having re-watched my favorite horror comedies, 'Evil Dead II' and 'Army of Darkness', I start to see raw qualities of 'Evil Dead II', a movie that is very focused in its crazyness. 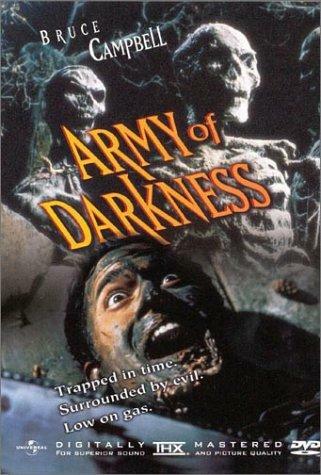 'Army of Darkness' is more slapstick and less insanity, more adventure and less horror, more grand battles and less gore. And most scathing of all, more 'Wild Wild West' than 'Braindead'. The movie starts out on the right track. My favourite scenes are all from the first half of the movie, the pit fight, the mill, which leads to the introduction of Bad Ash, and the famous Necronomicon scene. 'Clatu. Verata. Ni*cough*! Okay then.' As in the predecessor, Bruce Campbell is extremely entertaining, and the Ash character gets a little more fleshed out with a background story. From the halfway point on, however, the movie devolves into part anachronistic action-comedy, in the vein of, indeed, 'Wild Wild West' (being my favourite example of that particular style of filmmaking), and part classic fantasy rich with stop motion animated skeletons. The stop motion in particular seems very inspired by Ray Harryhausen's animation in 'Jason and the Argonauts' (1963), but Harryhausen's skeletons still have far superior animation to those of this 1992 movie. Danny Elfman composed the music for the skeleton battle march, and the rest of the soundtrack works well enough. A odd detail is that the intro theme is remarkably similar to the Cape Fear theme; probably by accident. The sound design as a whole is far less inspired than in the first movie. More mainstream, less insane, which makes it less interesting. This is a reasonably entertaining horror comedy, with some genuinely great moments in the first part, but it fails to achieve more than that, because it stretches itself too far into the mainstream action-comedy territory.